The Large size is PURPLE GRAPE. 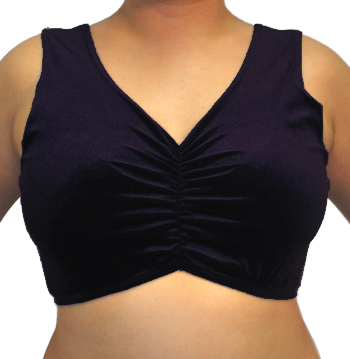 This comfortable sleeveless velvet choli top is great for class or Tribal or Gypsy Belly Dance costuming! This comfortable sleeveless velvet choli top is great for class or Tribal or Gypsy Belly Dance costuming! Made in India. *Please note: This item comes in different shades depending on which size you choose. Please refer to the caption under each photo. This choli is perfect on its own or layered with another top. The fit is comfortable and the gathered front adds interest to the costume piece. The colour is a rich jewel tone. Q: Will you have the midnight purple in the x-large in the sleeveless velvet choli top? A: Hi Cathie, Thank you for your question. This top has been discontinued and the X Large is no longer available.